Pic. 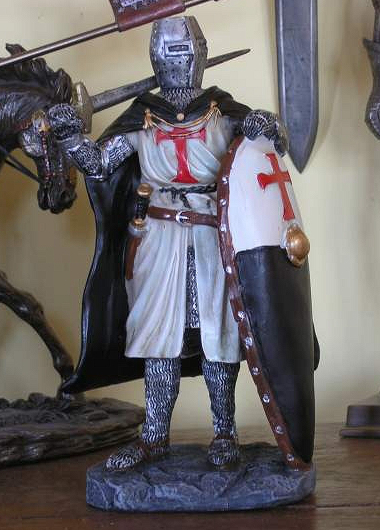 1 The image of the knight of the Order of the Knights Templar in battle gear. The Poor Fellow-Soldiers of Christ and of the Temple of Solomon existed between the twelfth and fourteenth centuries. They were commonly known as Knights Templar or simply Templars. Their name derived from the Latin word 'templum', which meant 'temple'. The term is associated with the seat of the Order, located in the area of the former Temple of Solomon in Jerusalem. It was created around 1118, when a knight from Champagne, Hugo de Payenes, along with his companions made his vows to the Patriarch of Jerusalem. Initially, the main task of the Knights Templar was to take care of the road safety and defend the historical sites associated with Jesus Christ. They led a simple, humble life, wearing what they received in charity. They also avoided any games and joys of chivalry, such as hunting, chess or performances of comedians. The crucial breakthrough in their initial activities came when the Pope Honorius II granted them an audience in 1127. As a result of it, at the next Synod overwhelming support for this order was expressed, as well the formal approval of its rule. In addition to the vows of poverty, obedience and chastity, characteristic for each congregation, the Templars made also another one. Namely, they undertook to fight the infidels persistently. From that moment on, they began to appear at the European courts and more effectively recruit volunteers wishing to join them. The head of the Order was the Grand Master, whose was elected by a council consisting of thirteen members. However, he had to consult the most important issues with the chapter. The Order owned as many as 13 provinces in Europe, including England, Flanders, Portugal, Sicily and Catalonia. The motto of the Knights Templar was a quote from Psalm 115: “Not unto us, O Lord, not unto us, but unto Thy name give glory”. Their seal had an image of two knights riding one horse, what was supposed to symbolize humility and poverty, and an inscription saying “The Seal of the Christ Warriors”. Since 1147, the Templars wore an octagonal emblem of the red cross on their white habits. It was given to them by the Pope as a symbol of martyrdom. It was also placed on their black and white flag, which has a meaning of war and peace. The Order dealt primarily with the fight against infidels, as well as patrolling the roads and opposing rebellions of the local people. The Order collapsed mainly because of the French ruler Philip IV the Fair. As he wanted to get rid of the debts contracted with the Templars, he accused the them of heresy and various blasphemous practices. In 1311, after a four-year trial, the council of Vienne decided to liquidate the Order, to confiscate its wealth in France and to burn the highest Templar dignitaries at the stake. The Templars usually fought with swords, which were the most commonly used weapons in the Middle Ages. It is a blade weapon with an open hilt, used mostly for cutting and thrusting. First swords were created in the Bronze Age, in the area of Egypt and China. The Medieval sword derived from the Roman spatha. It was the time of its greatest splendor, when it represented the most recognizable symbol of knighthood. What is more, a kind of cult of the sword developed during that age. It was no longer just a tool, but a nearly sanctified object. Allegiance was sworn to the sword and it was used in the crowning and knighting ceremonies. Moreover, it was often given a name and at the funeral of the last male heir, it was symbolically broken. Groups re-enacting the Templars' fights are formedall around the world. They use only solid replicas of weapons, armor and robes, strictly based on their historical prototypes. Such staging allows the audience to feel the spirit of the era and illustrate the knowledge acquired from books. They are extremely popular at various festivals, especially historical ones. If a reenactor wants to be authentic, he needs a replica of the sword made as precisely as possible. In the Global Replicas online store, the finest copies of weapons associated with many eras and cultures of the world can be purchased. 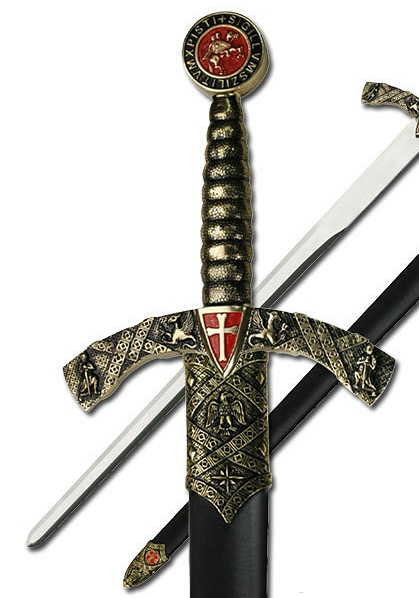 Templar swords have also been painstakingly recreated by producers supplying our shop, so every enthusiast of the history of this order may buy such an artifact. 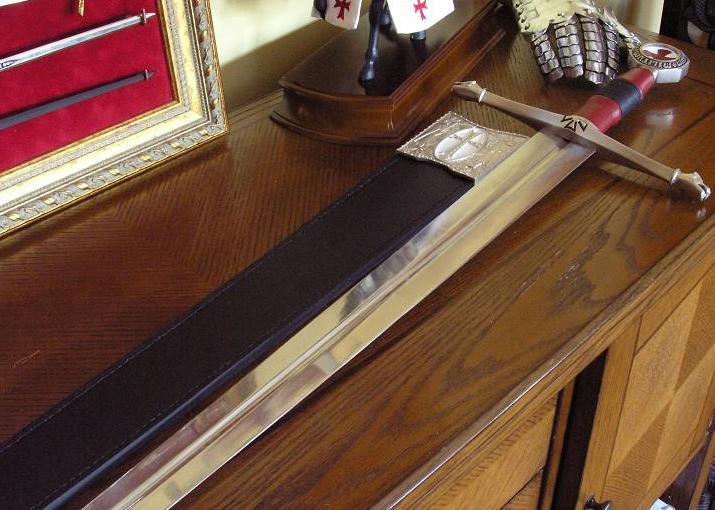 A sword replica always arouses enormous admiration and awe, as it is the sublime symbol of its era.